Cabin occupancy of 2-4. Studio cabins, 1 bedroom cabins. 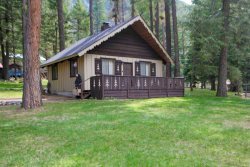 Knotty pine cabin walking distance to River, lake and activities.